Public speaking isn’t typically on most people’s list of favourite activities, and I don’t blame them! However, that doesn’t have to be your reality! Speeches can be really tough to prepare for, get psyched up about, and deliver. Lots of people get stuck putting their message together, never get comfortable up on stage, or struggle to connect with their audience. This article will address these three main concerns. The process of creating a speech can be very different from one person to the next. Some people build PowerPoint slide decks, others write cue cards, some prepare pages of texts…the possibilities are endless! However you set up your speech, keep this mind: the format should feel really good to you. If you are not comfortable with your own presentation, it will show up almost instantly. It’s your speech, so make it truly yours. Write your introduction to the core idea you’re sharing (in a way that your audience can understand). Outline your main points or stories that support your core idea (putting things in contexts that are appropriate for your audience). Wrap up with a quick conclusion of your core idea and thank your audience. As mentioned before, the physical material that a person walks into a speech with will vary from person to person. I once gave a speech using exactly one PowerPoint slide that had six images on it. The pictures were strategically aligned in a way that illustrated my core idea and the stories I wanted to share. As a result, they helped keep me on track throughout the talk. They gave my audience a visual reference to check, and allowed me to speak largely from the heart about a topic that was really important to me. Having a plan to let out any excess jitters or stress within the first minute or two of your talk is a key strategy for improving as a public speaker. Feeling stressed out about speaking is totally normal – even the best speakers in the world still get anxious from time-to-time. Where the pros tend to be really good is in their ability to deliberately get out of their heads and become present in the moment of their speech. I’m a big fan of leading with some kind of self-directed joke – something that brings out my personality and hopefully demonstrates my humility. When you take yourself off the pedestal of being a speaker, and approach your audience as a kind of peer, a lot of the pressure of speaking tends to go away. Each audience is unique. The ages, roles, backgrounds, beliefs, world views, etc. are all different from one crowd to the next. The more you’re able to understand the general nuts and bolts of who the people in front of you are, the greater your chance of successfully landing your message becomes. Why is this the case? When you know your audience and can imagine yourself in their shoes, you can more intuitively understand their problems, challenges, desires and opportunities. This allows you to present from a place of empathy and non-judgment. When you’re empathetic and non-judgmental toward your audience, they will become more empathetic and non-judgmental toward you – this is the ideal setting for a speaker to operate in. Now you can be your truest, most authentic and relaxed self! Are you talking to a group of savvy, veteran executives? Imagine their busy day-to-day lives and share any similar experience you may have in a leadership role. Speaking to a group of high school students about a difficult topic, one that makes most teenagers uncomfortable? Remind them (and yourself!) that you too were once in their position as an awkward teenager who also felt uncomfortable having the conversation that you’re initiating with them. Addressing a bunch of parents who are struggling to balance their work and family commitments? Even you aren’t a parent yourself, bring up the fact that you too witnessed your parents enduring the same struggle when you were living under their roof. It doesn’t take much, but bridging the gap between you and your listeners is paramount if you want to hit home with your speech. Public speaking is a skill. Like all skills, it can be trained and developed over time and through repetition. The more you speak, the better you can become at it (notice how I didn’t say that you will automatically become good at it!). Gathering feedback from your audience about how your coming across as a speaker and how well you’re delivering your message will allow you to continuously improve your craft. Like most long-term processes, becoming a speaker is often hard/fearful at first, messy/confusing in the middle, and fun/energizing as your confidence builds over time. Enjoy the journey that you’re on, and take pride in the fact that your work – while it won’t strike everyone equally – will change lives. I still remember moments of key speeches given by leaders, teachers, coaches, friends…they have all been a small but important contribution to the person I am today. We all have that power and potential: go out and make a difference with your voice! If you still need help preparing for your next big speech, feel free to reach me directly and we’ll discuss how to make your next talk a smash hit! Another place to check out is the website of Michael and Amy Port, over at Heroic Public Speaking. I’ve read some of Michael’s work – the guy is a total pro in this domain! 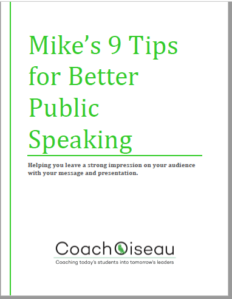 Enter your email below to get our public speaking tip sheet.